What kind of butter should I use? Unsalted? Yeah, unsalted butter would be the best. 請問低筋麵粉同普通麵粉有咩分別呀? 低筋麵粉嘅英文名稱點寫呀?可以响普通超市買到嗎? 我通常見到嘅只有 plain flour or wholemeal flour, 我仔仔好鐘意食,我真係好想做比佢食. 煩請解答!! Wow, you can make this at home! I hope to try this soon! 如果落哆 d 他他粉~ 個蛋糕係咪會再鬆 d~?? 如果我放多 d 他他粉~ 又係咪會鬆軟多 d 呢~?? On step 4, does it matter whether the egg yolk batter mix into the egg white form or the other way around? Is cream of tartar a crucial ingredient? Yes, it does matter. Add egg whites into batter in batches. Lightly fold-in thoroughly, instead of stirring, then add other egg whites. Normally, I fold-in egg whites into the batter in 3 batches. Cream of tartar would help stabilize your egg whites foam nicely. Some people might like to replace it with 1 tsp of lemon juice. I find cream of tartar is quite handy and reliable. Hi Christine, thank you so much for the prompt response. I just made some. I used lemon juice because I don't have cream of tartar at home. They turned out very good. Nice and soft. I have read and tried countless recipes of this cake, this the the best one by far. Although I made a mistake in step one. I added hot melted butter directly into the egg yolks, which kinda cooked them a little bit hahahahaha.... But they still tasty great. I also like the texture of this recipes. Thanks again! Glad you made your cakes with success! You'll enjoy more. I've made this kind of cake for many times. Every time they turned out great. My friends liked them very much. Thanks for your feedback! Happy baking! Hi Christine, I've try to make this cake 3 times already but no success. Why the cake deflate half of its size after about 10 minutes? I can't seems to be able to bake the cake to look and taste fluffy--where did I go wrong? 1. Was your egg white beaten to form peaks? Did you test it? 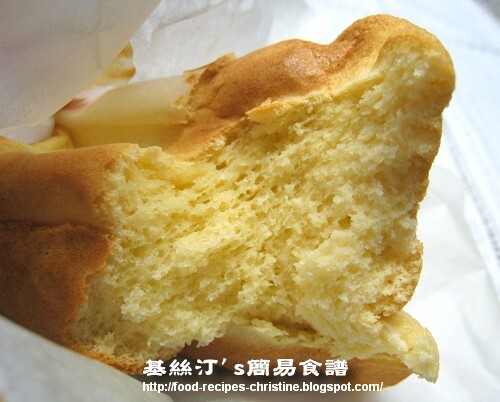 - The beaten egg white is the most crucial part to determine whether the cake is successful or not. 2. How did you mix the egg white? Did you fold them in the batter lightly? 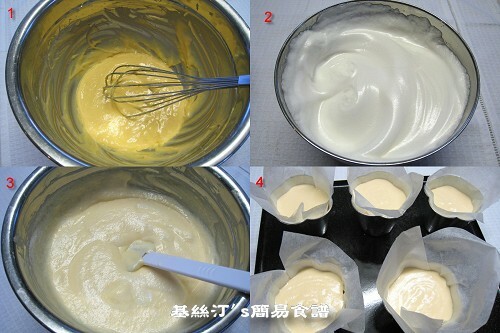 If you stir too hard, the air inside the egg whites would be destroyed, then the cake won't rise too high and deflates. Hi Christine, I've made another attempt to bake the cake but, the result does not look anything like yours--even I beat the egg white close to 20 minutes. The cake didn't look airy or fluffy. (there is no holes like yours) I have 2 questions. 1. Is step 2 suppose to look runny or very pasty I'm not sure if I over stir the mixture. I started to incorporate the butter and milk then put flour and stir until it look like paste, final step was to stir in egg yokes and vanilla(I stir it until it look thick and pasty). 2. I stir the egg white into the egg yoke mixture too gentle because I'm afraid I may deflate the egg white therefore I folded for good 5 minutes. (because egg white and egg yoke mixture are too thick) Am I over mixing the batter? Can you translate this recipe into English? I love this cake and I couldn't read Chinese. Thank you much. I have just made the cake. It is so delicious. Even though I don't have the right mould, I used muffin mould. It is smaller but taste is just the same or even better than those I bought in Perth. 請問一下，那個 牛油紙 (baking paper) 要去哪買呀? 我在外國超市都沒看到耶? Chinatown買的到嗎? Hi Christine, I guess you grow up in Western District after reading couple of your postings. Me two! You really bring back my childhood memories from all the old stores/famous food you mentioned. My flavourite flower cup cake is the one from a bakery near the Water Street Open Market. i always ask my mom to buy me some when she goes there. It's all gone now, but I still remember a little bit from it. 剛剛試做了, 發生很大問題! 我加了麵粉後, 變了一粒粒, 再加入蛋黃, 打勻後變了一團有筋性的麵團, 為什麼呢? I have the deflating problem too, but I have mix the egg white really high and stand, and I didn't stir it into the egg yolk but doing fold in. When it's in the oven, it rise really high, but after the heat is gone, it deflated. What is my problem? Hmmm... it's weird. Assume that you have beaten the egg whites to the stiff peaks, and folded in well, it shouldn't have any problems at all. The cup cakes will shrink a bit, it's normal, but won't deflate too seriously. Take a look at my videos posted on youtube. They might give you some insights. The links are on the sidebar. Oh, I just remember that I was using all-purpose flour instead of cake flour, would that be the reason too? Will it be better to beat the egg white longer this time? I'll try making it this weekend again. And if I want to change it to green tea taste, what adjustment should be made? You should've used cake flour for making this cake. Other kinds of flour is no good. You have to beat the egg whites to form firm peaks. Don't over beat them. It would turn runny otherwise. Just use a few tablespoons of water to dissolve your green tea powder, then add in the wet ingredients. Do you need to put the cakes upside down once it's out of the oven? The picture doesn't deem very sponggy as it looks collapse a bit. When I took this picture, I didn't put the cakes upside down. Just took some shots once they were out from oven. This kind of cake tends to shrink a bit easily once it cools down. But the taste is really good, full of eggy flavour. 2. I used a large muffin tin w/ a panettone liner that i found in Sur la Table.Then after that I had parchment paper to make it taller! I ended up having to pipe the batter into the mold because it would've made a mess if I spoon it in. did you pipe your batter too? ANy easier tricks you can share? 1. I bought the cake moulds from Hong Kong. 2. I didn't pipe out the batter, used to spoon the batter into the moulds with only a few drops at sides occasionally. 因為當我整牛油曲奇時, 不知道是否沒有將牛油融解先, 我不能將其攪至發大些, 出來的曲奇, 有點硬,好在味道都唔錯. I am in New Zealand. I cannot find the cake flour here in my town, do you think i can order it from somewhere ? Do you have any Asain grocery stores nearby? They should stock some cake flour. no need add in baking powder? No. The cake will be very fluffy because of the beaten egg whites. what adjustments can be made to the recipe so that the cake comes out even softer and fluffier? I made a batch today, they were great, but didn't look AS fluffy as yours. this is in relation to my previous post. would it be because i didn't add cream of tartar (couldn't find it anywhere)? i also used heavy cream instead of milk. Cream of tartar is a kind of acidic powder to stabilize the beaten egg whites. So when folding in the egg whites into the batter, the air won't easily be knocked out. What makes the cup cakes soft and fluffy is the air inside the beaten egg whites. Heavy cream is much thicker than milk. It could make the cup cakes more heavier, and affects the texture of egg whites. I'm so happy ^_^, that's my 1st try. I follow each step of your recipe to make this cake. I appreciate your detail instructions and helpful tips, thank you. Can I use less egg york or just use egg white only? Any wet ingredients need to adjust? 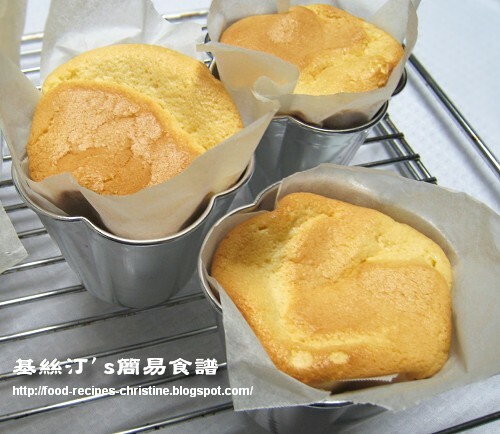 I follow the step one by one but my cup cake collapsed after they cool down. Why? Why this recipe doesn't need to add any baking soda/baking powder? Do you remember what went wrong while you made this cup cakes? It could be the problem of beaten egg whites or the fold-in. We don't need any baking powder for making these cup cakes, as the beaten egg whites play the role of raising agent, making the cakes rise high and fluffy.